Healthcare professionals across the world use Detecto’s body fat analysis scales to measure their patients’ nutritional health. These reliable, digital doctor scales measure body fat, bone mass, muscle mass, and and body water percentages. They also calculate a Body Mass Index (BMI) measurement. Choose “Normal” mode or “Athlete” mode to ensure reliable weighing and analysis for all patients. Select body fat scale models also include a digital or mechanical height rod. Optional stainless steel wall-mount grab bars are available for patients who need additional support. DETECTO’s ProDoc PD350 series body fat analysis scales host many powerful features that are vital to proper weight management and crafting a healthier body. As shown in this 5-minute demo video, DETECTO’s PD350 series offers medical-grade accuracy and durability built for long life spans in high-traffic fitness centers, corporate or hotel gyms, nutritionist’s offices, and clinical facilities. The PD350 series is available with digital or mechanical height rods and an optional P50 thermal tape printer. Why should I buy a scale that is “Legal-for-Trade” when I don’t intend to use it in a Commercial Weighing application? There are a number of questions we get from time to time regarding legal for trade scales. 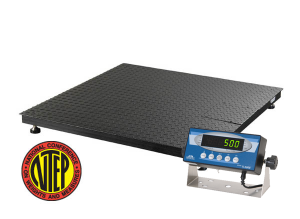 Often, especially with floor scales we are asked “why should I buy a scale that is “Legal-for-Trade” when I don’t intend to use it in a commercial weighing setting”? Defining a commercial weighing application can sometimes be a little tricky. Scales can be moved around and get used for things that maybe you didn’t originally intend. Basically, an NTEP approved device is required any time money changes hands based on a scale’s reading. We sometimes call this legal for trade scales or we might call it NTEP certified equipment. Freight scales, for example, must be NTEP approved. For these situations government requires that a scale must pass tests put forth by the National Type Evaluation Program (NTEP). These regulations are meant to protect the consumer. But if I were in the market for a scale, in most cases, I would want to choose a scale that was at least capable of passing NTEP testing and receiving an NTEP certificate. If you think about it, we use a scale because we want to know an exact weight (as accurately as possible) and have trust in the information we view on the scale display. When selecting a scale to weigh your produce, or packages, would you choose one that’s been tested and approved by an independent third party as accurate, or would you rather have a scale that’s never been tested at all by an independent group? In most cases I would choose the scale that has been tested and received a conformance certificate. Sure there are some markets and applications where NTEP certified scales are not really necessary. But when you’re comparing a legal for trade scale side by side with one that is non-ntep, ask yourself or your scale sales person a question. Could this non-ntep scale have earned a NTEP certificate of conformance? If the answer is yes you may be ok with purchasing a non-ntep scale. The non ntep scale probably costs less, but is the scale accurate and stable as well? How will you know for sure the scale is accurate? And if you need to replace it sooner than expected, how much money did you ultimately really save buying a non legal for trade scale? If the sales person says no, the scale probably would not be capable of earning a certificate of conformance, that would cause me re-evaluate the product and my products that I’m looking to purchase. Ultimately, it’s up to you the end user to decide what direction you want to to.